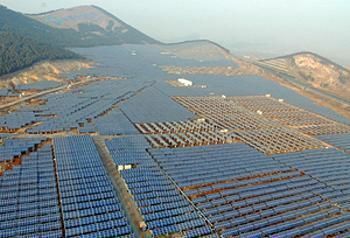 Tom Phillips’ article on China’s construction of the world’s largest solar panel farm is a useful primer on the various perspectives surrounding the project. China’s grandiose scale of renewable energy initiatives can be read as a strategic move to increase their global soft-power. This is prescient in a world where many global superpowers regard climate change as a serious threat. Phillips acknowledges this upscaling as stratagem when he notes its concurrence with the election of a U.S. President who is a climate-denier. But a single solar farm, no matter the grandeur of its sobriquet, cannot nullify the environmental impact of an entire nation, and issues of curtailment – energy produced that does not reach the grid – undercut the potential reformative power of China’s green energy production. According to a New York Times article also on the new solar farm, 19% of China’s wind energy produced in the first six months of 2016 was curtailed, compared to “negligible” amounts of energy lost in the U.S. [www.nytimes.com/2017/01/05/world/asia/china-renewable-energy-investment.html]. And while China’s current enthusiasm for energy reform is a hopeful sign, long-term commitment is necessary for real change. If current initiatives are only political maneuvers made in a global climate that is changing with the succession of a Trump presidency, then the difference Phillips reports between “a climate leader but not the climate leader” will be felt in their, the initiative’s, long-term ineffectiveness. Is a China-as-world-climate-leader that unimaginable in a world of said radical change? The citizens of China should not be left out of a discussion of the country’s turnaround. With increases of toxic-smog and mass evacuations displacing people as “smog refugees”, public discontent over pollution has risen with China’s emissions [www.theguardian.com/world/2016/dec/21/smog-refugees-flee-chinese-cities-as-airpocalypse-blights-half-a-billion]. Considering domestic crises such as these, China’s ideological shift is not only politically expedient but humanitarianly necessary. With the capacity to generate 850MW, enough power to fulfill the energy needs of ~200,000 homes, China’s new solar farm stands to make considerable improvements for its citizenry. This entry was posted in Parker Head, Photovoltaics and tagged Airpocalypse, China, Michael Forsythe, Smog Refugees, The Guardian, The New York Times, Tom Phillips, Trump, World’s Largest Solar Farm by Emil Morhardt. Bookmark the permalink.